If you could be any animal in the wild kingdom what animal would you choose? To make this easier let’s narrow the choice to birds. The other day while listening to a podcast, the guest, a standup comic, compared high soaring eagles to the lowly penguin. Birds of prey soar high, look cool and menacing at the same time, and are also high high up on the food chain. He was referring to the way leopard seals and other predators always view penguins. They see them as waddling little meat bags. So my question to you is this: Do you feel like a swift, agile raptor, soaring high? Or more like a cute but vulnerable “feather sausage” shuffling through the day, just waiting to be pounced upon? Sure, it’s a silly analogy. Everyone loves penguins. They’re cute, loyal, and pretty darn resilient actually. But I can’t get past thinking of them as little waddling sausages. Do people fear public speaking more than death (or lions)? You know about the worry, fear, and tension that comes with public speaking. Much of this is rooted in our past as a species. We mere mortals have a natural fear of being excluded from the tribe and there’s a very good reason for this. If you were a caveman who didn’t carry out your caveman duties well or couldn’t keep up you might have found yourself kicked out of the group. Soon ravenous and without your caveman buddies, you’re vulnerable, just waiting for a giant, hungry cat to strike. That primal fear of being cast from the tribe and having to face the aftermath has the same physiological signs people experience when they give a presentation in front of a group. Think about that last presentation you gave. Maybe there was a bit of perspiration, a feeling of distress, and alertness, ever aware that the predators (your audience) were ready to pounce. If a talk doesn’t go well, your lizard brain is screaming that the tribe may not like you, will banish you, and you’ll be left to fend for yourself. Our caveman forbears did a variety of things to NOT get cast out of the group. They became good hunters, got better at toolmaking, or maybe even telling nighttime stories. Today, you have so much at your fingertips. So many ways to succeed, but oftentimes the “woe is me” naysayer comes in, fear takes over, and instead of improving, you sulk, let unease rule the day, and surrender to your fears. As a human it’s natural for you to see the world as a place filled with possibilities. To dream and visualize a great future. But then your inner naysayer comes in to whisper defeatist thoughts in your ear. You can dream but you’ll ultimately fail. You’re not “there” and probably never will be, sorry. Don’t try to soar, you’ll get struck down. Today’s lesson is a simple one. It’s about not letting fear rule. To quiet the inner defeatist and work to reframe your thoughts, daily. Making your daily journey focused, rewarding, and fear-busting is within your grasp. But your self-critical sabotage is usually what stifles your efforts. The online realm has leveled the playing field for those looking to grow through entrepreneurship and learning. Amazing tools and technologies are reshaping the flow of information, power, and influence. The vast accumulated knowledge of mankind is there for the taking, alive in the digital space. Today’s technology gives you a wicked powerful arsenal of tools to create and grow. This, combined with the right attitude, can bring success. Yet, many people are engulfed in information, struggling with life, or just plain tired. Giving power to their defeatist inner enemy. We start, stop, repeat, then throw in the towel. We get devoured by life. So, how does one soar, and avoid being a lumpy feather sausage? 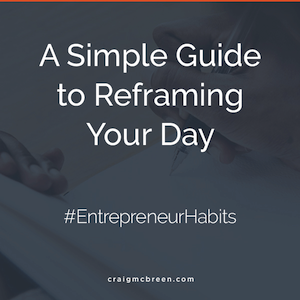 It starts with you, framing the possibilities ahead—what you know you can do. You have a story, we all do. But now it’s time to create frame of reference and build a storyline for your future. Now, think like a businessperson. That sounds like a pretty damn amazing “kick in the shins” self-motivational talk, but it may not be the best way to setup your future and ongoing narrative. “With such amazing tools and technology at my disposal, I can develop a plan using a mix of marketing strategy, networking, and online tools to craft an online presence that moves the needle. This is how I will soar, but I need a plan and the very first step is to reframe my story and kill the inner-naysayer daily. Good habits can make or break me. c. Have a plan and be clear in my mission. Now that’s a simple reframing that’s a better way to move to change. Stop thinking about your life, your business, yourself as a problem that needs to be fixed. Instead create context. Your story. Your company’s story. A space of reality, structure, and ambition. A rewarding, but structured daily routine and plan that lights you up. Don’t think in terms of problems. Think in terms of possibilities. The alternative is the problem child who always places too much pressure on himself. It’s hard to break free of this, ’cause we’ve been taught to think this way. Our inner-naysayer feasts on fear and this fear programming is in all of us. Soar and don’t be a sausage. Today, stop, reframe, and start anew.